Glaze chemistry is learning what each oxide does in a fired glaze and the relative advantages and disadvantages of each material supplying it. The chemistry of a glaze is expressed in a manner similar to its recipe, except that the items are oxides and the amounts can be by weight (an analysis) or numbers of molecules (a formula). There are close links between the way glazes fire in a kiln and their chemistry. Physical properties like color, hardness, melting temperature, thermal expansion, leachability, etc. are all direct products of the oxides present in their chemistry. The relationship between chemistry and fired properties of glazes is a matter of much study. Companies who understand specifics within certain temperature and process systems have often leveraged this knowledge to develop important products. Knowing about chemistry is also important to being able to substitute materials in recipes while maintaining their chemistries. 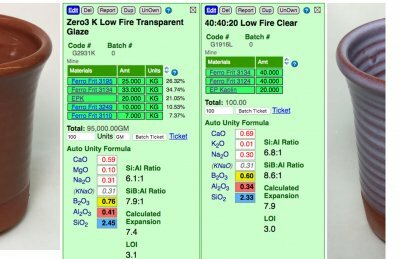 Understanding the relationship between the absolute and relative amounts of the common oxides appearing in a typical glaze formula to the physical presence of a fired glaze itself is the key to control. An education in glaze chemistry usually starts with a study of each of the dozen or so oxides that a fired glaze is conceptually structured from and what properties each contributes to the fired glaze (and their interactions). Oxides are divided into three main categories (which flux, stabilize and build glass), oxides within each contribute more specifically to properties of the fired glass. A study of what materials contribute what oxides usually follows. 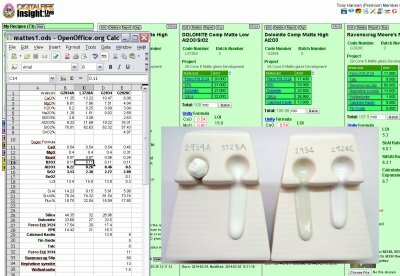 Finally people learn how to use a computer program to study existing glazes and explain their behavior and start adjusting them to alter properties or fix problems. Understanding this is well within the reach of anyone and is actually much simpler than trying to grasp the relationship between the recipe of a glaze and its firing behavior. 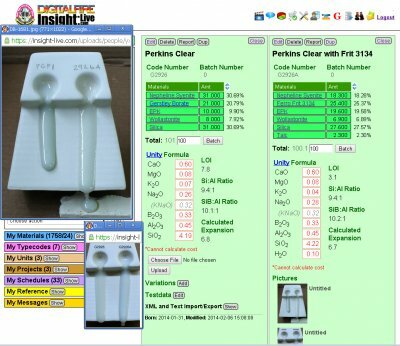 Software, like an account at insight-live.com, automates tracking of material analyses and calculating the composite formula of a mix of them. Glaze chemistry is not an absolute science. Many other factors interplay with the chemistry (e.g. physical presence of materials, process) to affect how we can rationalize the degree to which the chemistry is responsible for fired properties we seek. This imprecision makes glaze chemistry a relative science. There are no absolute rules about what ratios or amounts should be (although technicians do learn general ranges with experience in testing and assessing existing recipes). Expansion calculations are an example. They are relative within a system (material or oxide). 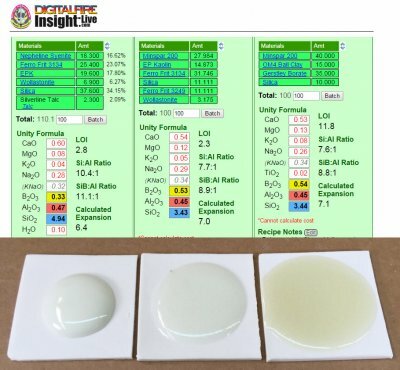 For example, if you have a dolomite, whiting, feldspar, kaolin, silica glaze and you try a bunch of minor variations, the calculated expansions will give you a fairly accurate indication of which variations have higher and lower expansions and to what degree. But if you make a major change to the oxide balance (perhaps moving toward a high MgO from a high KNaO content) while still using the same materials, the calculated thermal expansion difference between the two will often not accurately reflect the actual measured differences. Even more significantly, if lithium carbonate, for example, is introduced (or a boron frit, or zinc, for example) it is now a different system and different factors affecting the proximity of calculated and actual thermal expansion come into play. Glaze chemistry cannot be taken in isolation from the character of the minerals and materials that supply the oxides. The manner and temperatures at which they decompose to liberate their oxides is determined by many factors. For example, a mineral and frit could have close to the same chemistry but they melt in completely different ways (because the former is crystalline and the latter is a glass). Calcined alumina appears to be just Al2O3 on paper, but incredibly high temperatures are needed to convince it to release its oxide to a glaze melt. 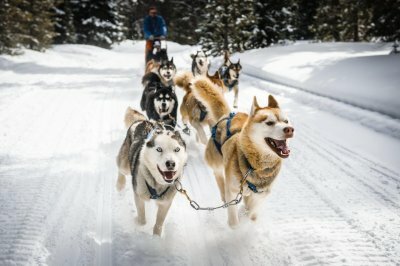 So, while in theory, chemistry considers all materials on an equal footing as suppliers of oxides, in practice materials themselves have unique melting behaviours. A glaze will melt much better if it sources MgO from a frit instead of dolomite or talc. Feldspar far more readily releases SiO2 to the melt than does raw quartz. In fact, quartz particles literally need to dissolve in a melt of other things, be taken into solution in it, normal kiln temperatures will not melt them. Other materials must interact, they do not melt on their own (e.g. calcium carbonate and dolomite are refractory enough to be used for making kiln bricks, but when combined in the right way with others, will actively melt). -Some oxides, like Li2O do not impose their expansions in a linear fashion or in accordance with their proportion. -The degree to which a glaze is completely melted determines the degree to which its expansion calculation is valid. -Crystallization: A melt that freezes to a crystalline solid has a very different thermal expansion than when it freezes to a glass. -Non melting particles: Zircon imposes its expansion as a non-participant in the glass structure, this is very different than if it were to melt and participate in the glass chemistry. Alumina (calcined vs hydrate) is a similar story. -Oxides interact: The expansion contribution of one may be different depending on which other oxides are present. As noted, in glaze chemistry we apply our knowledge of how oxides affect fired glazes to propose changes that have a high likelihood of moving a glaze property (e.g. melting temperature, thermal expansion, color compatibility) in a certain direction. We then make fired tests and compare the magnitude by which physical changes vary from the original (changes we can see and measure). Finally we propose additional changes or testing directions based on what has been learned. An important skill that is learned over time is the ability to separate the chemistry from the effects of material mineralogy and physics and process and firing, how to determine the degree to which each is affecting the test results. • Why is my glaze leaching? Is it likely to leach? • Why is this glaze so touchy and difficult to keep consistent? • How do I fix crazing, blistering, pinholing, settling, gelling, clouding, leaching, crawling, marking, scratching, powdering? • How can I change the firing temperature? The gloss? Mattness? • Why doesn’t this colorant work in this base glaze? • How do I substitute materials that are expensive, problematic, unavailable? One frit for another? • How can I best utilize raw materials that I have easy and inexpensive access to? Use them in the highest possible percentages? • Can I predict what possible weaknesses my glazes will have? 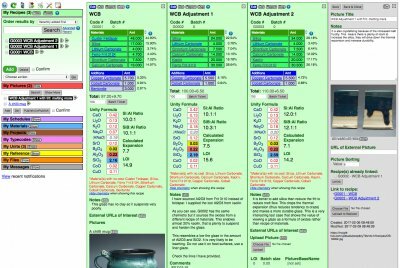 • How can I create and optimize base glazes that I can opacify, crystallize or variegate? As noted, glaze chemistry is a relative science and changes to the chemistry of a glaze are interpreted as to what it will do in a relative sense (e.g. melt lower, thermally expand more, be more or less matte, etc). The chemistry of bodies is not normally considered indicative of fired properties (for example, one cannot calculate the thermal expansion of a clay body). Thermal expansion calculations assume a glass where all oxides can impose their proportionate expansion on the whole. This does not work for crystalline solids. Clay bodies do not melt like glazes, the oxides do not form a homogeneous glass, they undergo complex crystallization while cooling in the kiln. A glass and crystal of the same chemistry usually have wildly different physical properties. Variations in particle size distribution, particle mineralogy and shape, firing speed, atmosphere and duration of firing all affect the progressive stages of decomposition and play out of interactions that break and build molecular bonds; these variations are evident in the fired product and all beyond the scope of the chemistry. Consider SiO2 oxide content: It may be equal in two bodies, but one may have most of the SiO2 in quartz grains and the other might have it as a molecular component of feldspar and kaolin. These will, of course, have vastly different thermal expansions. What can you do using glaze chemistry? There is a direct relationship between the way ceramic glazes fire and their chemistry. Wrapping your mind around that and overcome your aversion to chemistry is a key to getting control of your glazes. You can fix problems like crazing, blistering, pinholing, settling, gelling, clouding, leaching, crawling, marking, scratching, powdering. Substitute frits or incorporate better, cheaper materials, replace no-longer-available ones (all while maintaining the same chemistry). Adjust melting temperature, gloss, surface character, color. Identify weaknesses in glazes to avoid problems. Create and optimize base glazes to work with difficult colors or stains and for special effects dependent on opacification, crystallization or variegation. 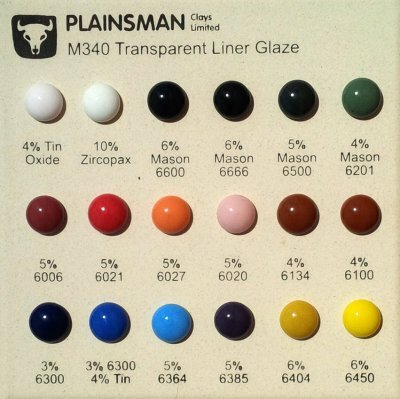 Create glazes from scratch and use your own native materials in the highest possible percentage. 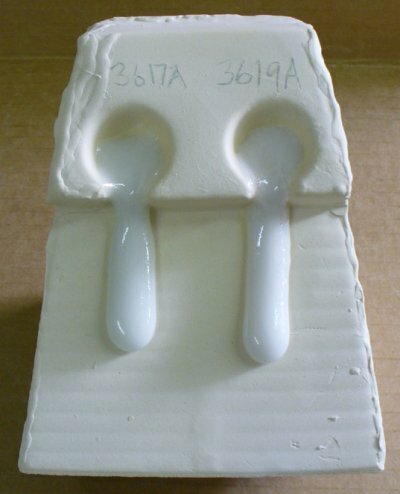 This is an example of cutlery marking in a cone 10 silky matte glaze lacking Al2O3, SiO2 and having too much MgO. Al2O3-deficient glazes often have high melt fluidity and run during firing, this freezes to a glass that lacks durability and hardness. But sufficient MgO levels can stabilize the melt and produce a glaze that appears stable but is not. Glazes need sufficient Al2O3 (and SiO2) to develop hardness and durability. Only after viewing the chemistry of this glaze did the cause for the marking become evident. This is an excellent demonstration of how imbalance in chemistry has real consequences. 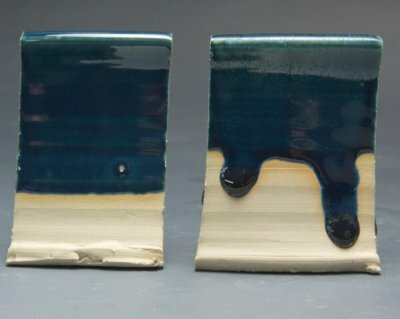 It is certainly possible to make a dolomite matte high temperature glaze that will not do this (G2571A is an example, it has lower MgO and higher Al2O3 and produces the same pleasant matte surface). The Ravenscag:Alumina mix was applied to a buff stoneware fired at cone 10R (by Kat Valenzuela). Matting begins at only 5% producing a very dry surface by 15%. This "psuedo matte" surface is simply a product of the refractory nature of the alumina as a material, it does not disassociate in the melt to yield its Al2O3 as an oxide (as would a feldspar, frit or clay). The same test using alumina hydrate demonstrates that it disassociates somewhat better (although not completely). 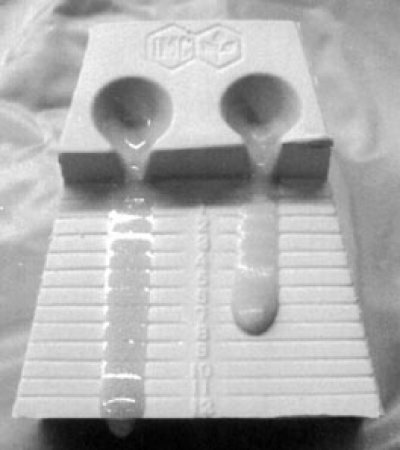 These flow tests demonstrate how similar the substitute recipe (left) is to the real material (right). 20% Frit 3134 has been added to each to enable better melting at cone 5 (they do not flow even at cone 11 without the frit). 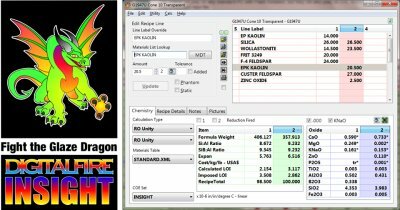 Links below provide the recipe for the substitute and outline the method of how it was derived using Digitalfire Insight software. This substitute is chemically equivalent to what we feel is the best average for the chemistry of Cornwall Stone. Employing a frit on unknown chemistry in your glaze recipe ..
Is like adding a dog of unknown breed to this team. How predictable is that going to be? It is like that with ceramic glazes. They fire the way they do because of their chemistry. Not knowing the chemical makeup of a key ingredient robs you of the single biggest tool to explain characteristics or issues or propose and adjustments, improvements or fixes. This is crazing. It is bad on functional ware. Shivering and leaching are also bad. And blistering. And other problems like devitrification and clouding compromise the visual appearance of ware. Science is needed to understand what these are, how serious they are and determine the cause and solution. And the language of science is needed to clearly describe all of this. And methodical testing to prove the solution. It is not rocket science, just simple ceramic science. Powdered samples were sent to the lab. The numbers shown on this report are in percentage-by-weight. That means, for example, that 15.21% of the weight of the dry powder of Alberta Slip is Al2O3. 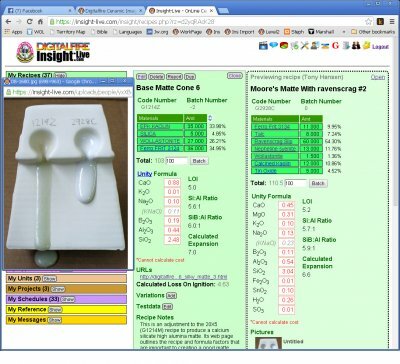 Insight-live knows material chemistries in this way (whereas desktop Insight needs them as formulas). Some non-oxide elements are quantified as parts-per-million (these amounts are not normally high enough to take into account for traditional ceramic purposes). The LOI column shows how much mechanically and chemically bound water are gassed off during firing of the sample. 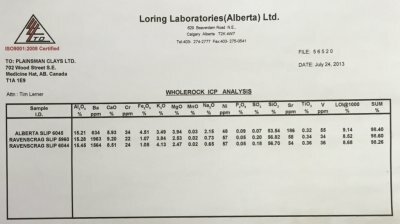 The total is not exactly 100 because of inherent error in the method and compounds not included in the report. A book published by Tony Hansen. It explained why were need to think about materials (and the bodies and glazes made from them) as more than just powders. They have physical, chemical and mineralogical presences that do not take a lot of effort to understand. This was the first widely read book to show how, armed with this information and a knowledge of how to do glaze chemistry, readers could solve all sorts of problems. It showcased the real value of the oxide viewpoint in ceramics and explained how to use Digitalfire Insight and Foresight software in each scenario. From 2000-2014, the book was used as courseware in universities around the world. In 2015 the book was temporarily removed from distribution at digitalfire.com awaiting a new edition. 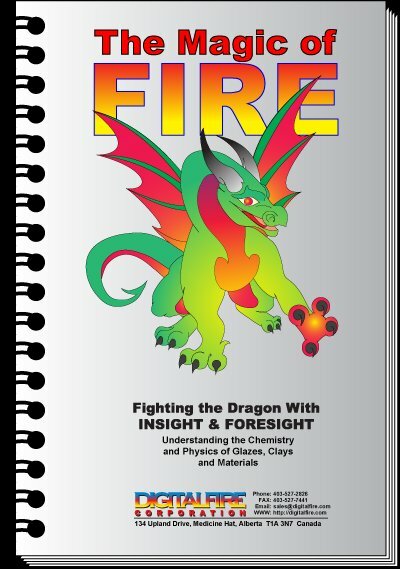 Readers were reminded that all of the books content was available at the Digitalfire Reference Library. 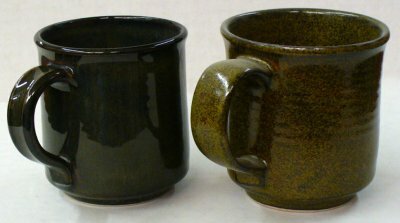 The same glaze with MgO sourced from a frit (left) and from talc (right). The glaze is 1215U. Notice how much more the fritted one melts, even though they have the same chemistry. Frits are predictable when using glaze chemistry, it is more absolute and less relative. Mineral sources of oxides impose their own melting patterns and when one is substituted for another to supply an oxide in a glaze a different system with its own relative chemistry is entered. But when changing form one frit to another to supply an oxide or set of oxides, the melting properties stay within the same system and are predictable. Mineral sources of oxides impose their own melting patterns and when one is substituted for another to supply an oxide a different system with its own relative chemistry is entered. An extreme example of this would be to source Al2O3 to a glaze using calcined alumina instead of kaolin. Although the formula may be exactly the same, the fired result would be completely different because very little of the alumina would dissolve into the glaze melt. At the opposite extreme, a different frit could be used to supply a set of oxides (while maintaining the overall chemistry of the glaze) and the fired result would be much more chemically predictable. Why? Because the readily and release their oxides the the melt. Pure Ravenscrag Slip is glaze-like by itself (thus tolerating the alumina addition while still melting as a glaze). 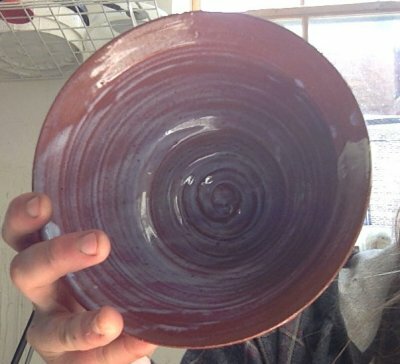 It was applied on a buff stoneware which was then fired at cone 10R (by Kat Valenzuela). This same test was done using equal additions of calcined alumina. 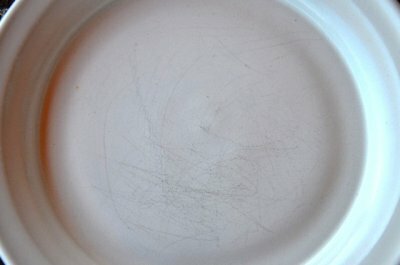 The results suggest that the hydrated version is decomposing to yield some of its Al2O3, as an oxide, to the glaze melt. By 15% it is matting and producing a silky surface. However crazing also starts at 10%. The more Al2O3 added the lower the glaze expansion should be, so why is this happening? It appears that the disassociation is not complete, raw material remains to impose its high expansion. This liner glaze is 10% calcium carbonate added to Ravenscrag slip. 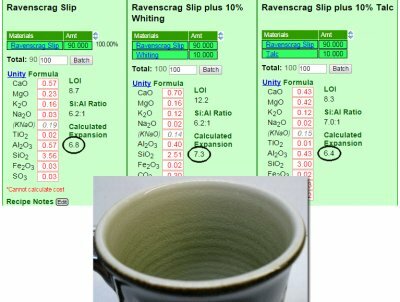 Ravenscrag Slip does not craze when used by itself as a glaze at cone 10R on this body, so why would adding a relatively low expansion flux like CaO make it craze? It does not craze when adding 10% talc. This is an excellent example of the value to looking at the chemistry (the three are shown side-by-side in my account at Insight-live.com). The added CaO pushes the very-low-expansion Al2O3 and SiO2 down by 30% (in the unity formula), so the much higher expansion of all the others drives the expansion of the whole way up. And talc? It contains SiO2, so the SiO2 is not driven down nearly as much. In addition, MgO has a much lower expansion than CaO does. 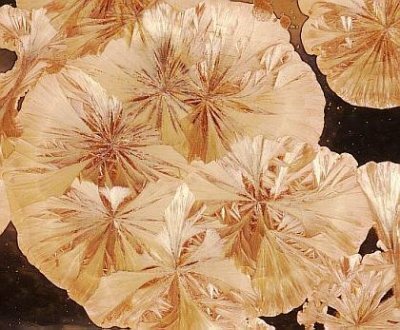 What could make glazes grow these incredible crystals? Closeup of a crystalline glaze by Fara Shimbo. Crystals of this type can grow very large (centimeters) in size. They grow because the chemistry of the glaze and the firing have been tuned to encourage them. This involves melts that are highly fluid (lots of fluxes) with added metal oxides and a catalyst. The fluxes are normally B2O3, K2O and Na2O (from frits), the catalyst is zinc oxide (alot of it). 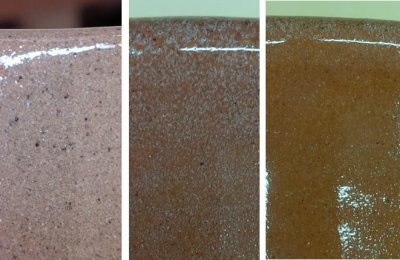 Because Al2O3 stiffens glaze melts preventing crystal growth, it is very low in these glazes (clays and feldspars supply Al2O3, so these glazes have almost none). The firing has a highly controlled cooling cycle involving rapid descents and holds (sometimes multiple cycles of these). Between the cycles there are sometimes slight rises. Each discontinuity in the cooling curve creates specific effects in the crystal growth. Thousands of potters worldwide have investigated the complexities of the chemistry, the firing and the infinite range of metal oxides additions. The two cone 04 glazes on the right have the same chemistry but the center one sources it's CaO from 12% calcium carbonate and ulexite (the other from Gerstley Borate). The glaze on the far left? It is almost bubble free yet it has 27% calcium carbonate. Why? It is fired to cone 6. At lower temperatures carbonates and hydrates (in body and glaze) are more likely to form gas bubbles because that is where they are decomposing (into the oxides that stay around and build the glass and the ones that are escaping as a gas). By cone 6 the bubbles have had lots of time to clear. What happens when glazes lack Al2O3? This happens. They are glossy, but lack thickness and body. They are also prone to boron blue clouding (micro crystallization that occurs because low alumina melts crystallize much more readily on cooling). Another problem is lack of resistance to wear and to leaching (sufficient Al2O3 in the chemistry is essential to producing a strong and durable glass). This is a good example of the need to see a glaze not just as a recipe but as a chemical formula of oxides. The latter view enables us to compare it with other common recipes and the very low Al2O3 is immediately evident. Another problem: Low clay content (this has only 7.5% kaolin) creates a slurry that is difficult to use and quickly settles hard in the bucket. Same high-iron glaze. One crystallizes and the other does not. Why? Both mugs have the same cone 6 oxidation high-iron (9%), high-boron, glossy glaze. Iron silicate crystals have completely invaded the surface of the one on the right, turning the near-black glossy into a yellowy matte. Why? Three things. It was slow-cooled and the other free-fall-cooled (firings done in the same kiln). 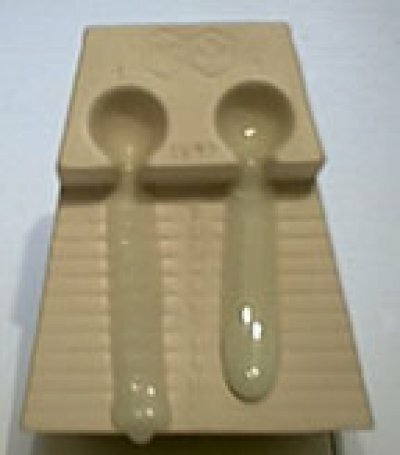 The glaze has a fluid melt (it runs) and its percentage of iron is high enough that it could precipitate out from solution in the melt (given the time). Susceptible glazes have a temperature at which crystals form the best and that temperature can be hundreds of degrees down from the firing cone (or higher if precipitation is occurring). In industry, devitrification is regarded as a defect. But potters call it crystallization. 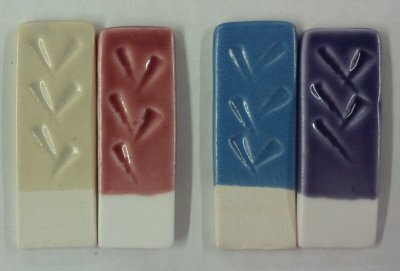 Understanding (especially the chemistry and materials) and experimental firings are needed to learn to control and exploit the effect in a glaze. It seems logical (and convenient) to just say that the kiln does not care what materials source the oxides in a glaze melt. Li2O, CaO, Al2O3, SiO2 are oxides (there are about ten common ones). The kiln just melts everything and constructs the glaze from the ones available. Right? Wrong! Things get more complicated when frits are introduced. Frits are man-made glasses, they melt much more readily than raw materials like feldspar. Raw materials are often crystalline. Crystals put up a fuss when asked to melt, often holding on as long as they can and then suddenly melting. Frits soften over a range and they start melting early. 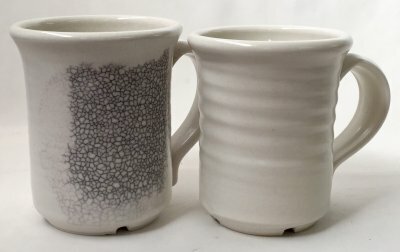 To illustrate: These two glazes have the same chemistry. But the one on the left sources sodium and alumina (Na2O3, Al2O3) from the 48% feldspar present. The other sources these from a frit (only 30% is needed for the same amount of Na2O3). The remainder of the recipe has been juggled to match the other oxides. The frit version is crystallizing on cooling (further testament to how fluid the melt is). What has happened here is great. Why? First, the chemistry has not changed (fewer firing differences). The frit has no Al2O3, it is being sourced from kaolin instead, now the slurry does not settle like a rock. Even better, silica can be added until the melt flow matches (might be up to 20%). That will drop the thermal expansion and reduce crazing. The added SiO2 will add resistance leaching and add durability. Frits are great! But you need to know how to incorporate them into a recipe using a little glaze chemistry. The original cone 6 recipe, WCB, fires to a beautiful brilliant deep blue green (shown in column 2 of this Insight-live screen-shot). But it is crazing and settling badly in the bucket. The crazing is because of high KNaO (potassium and sodium from the high feldspar). The settling is because there is almost no clay. Adjustment 1 (column 3) eliminates the feldspar and sources Al2O3 from kaolin and KNaO from Frit 3110. The chemistry of the new chemistry is very close. 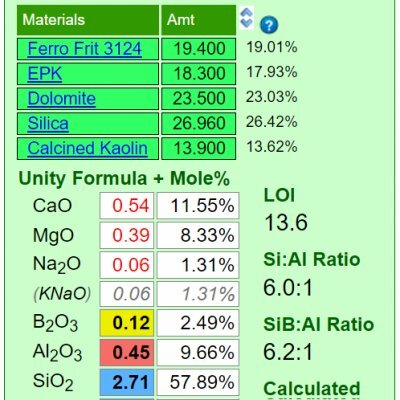 To make that happen the amounts of other materials had to be juggled (you can click on any material to see what oxides it contributes). But the fired test reveals that this one, although very similar, is melting more (because the frit releases its oxide more readily than feldspar). Adjustment 2 (column 4) proposes a 10-part silica addition (to supply more SiO2). SiO2 is the glass former, the more a glaze will accept, the better. Silica is refractory so the glaze will run less. It will also fire more durable and be more resistant to leaching. Why would a low fire transparent require four frits? To get the needed chemistry to avoid boron blue clouding (calcium borate crystals). The one on the right clouds, the other does not. Why? Differences in the chemistry (as seen in my account at insight-live.com). G2931K, on the left, has greater Al2O3 (which impedes the growth of crystals), lower CaO (starves their growth) and more boron (for better melting). There is actually no practical way to adjust the recipe on the right (by supplying MgO with talc and fiddling with frit percentages) to achieve this. Frit 3124 lacks Na2O and B2O3. 3134 has excessive CaO and almost zero Al2O3. Talc does not melt well enough. But Frit 3249 supplies the needed MgO and has lots of B2O3 and low CaO. And Frit 3110 has low CaO and supplies the needed Na2O. (Articles) Where Do I Start? 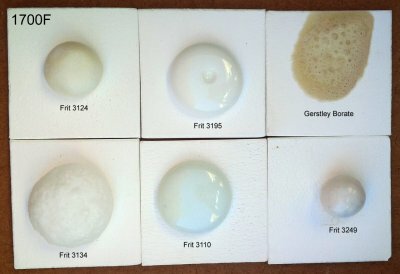 (URLs) Does anyone care about glaze chemistry?